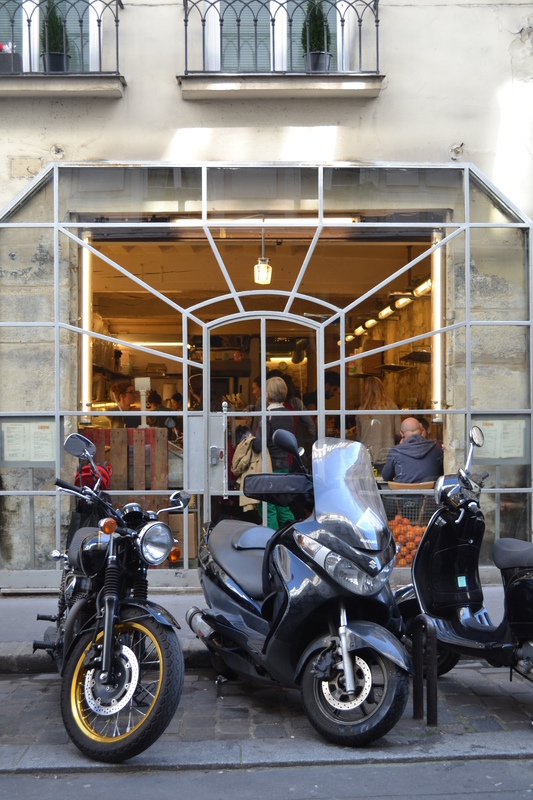 Sunday can be a very quiet day in Paris, but there’s one area that’s always buzzing – the Marais. Here, the trend for Sunday brunch (primarily a British/American tradition) is really growing in popularity – and there’s nothing nicer on a sunny Sunday morning than sipping a coffee, soaking up the atmosphere and watching the world go by. When looking for a good place to eat, we came across Rose Bakery, which is actually a British eatery (the owner Rose, is from the UK). 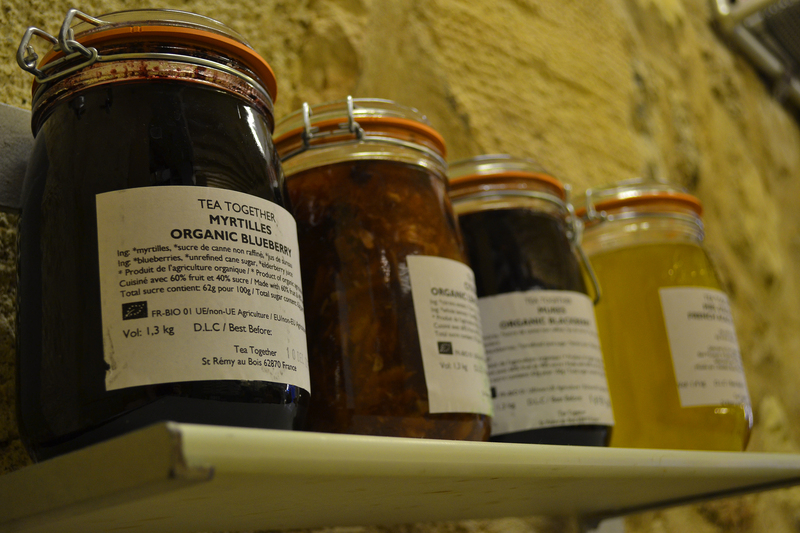 Located just off the bustling Rue de Bretagne, it’s reputation preceded it as a trendy spot with honest, homemade food, organic produce and quirky, minimalist interiors. It was certainly getting busy when we arrived and we took a seat overlooking the open deli kitchen where chefs were busy making tasty cakes (apparently their carrot cake is to die for). 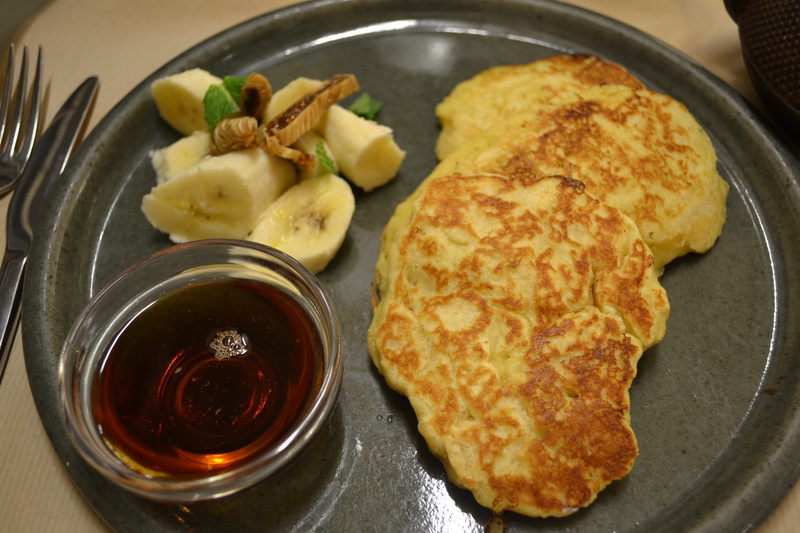 Breakfast was on my mind, however, and I ordered banana pancakes (11.50e). Eggs Benedict is usually my go-to brunch of choice, but I felt it was a little steep price-wise as 17.50 euro…The pancakes were delicious, nevertheless, and came with a little glass of maple syrup (which I would always warm before serving t keep the pancakes toasty hot, but that’s just me) and a serving of banana and dried fig. Scrumptious. My almost ‘de-constructed’ pot of tea came with two little glasses – one to drink out of and one smaller glass of milk. I couldn’t really get my head around pouring milk from one glass to another (what’s wrong with teacups and a jug?! ), but it certainly was an interesting way to serve it. Got any recommendations for brunch in Paris? Comment below!